July 15th, 2013 | Moving Tips. 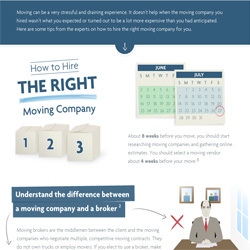 Do you know how to hire the right moving company? Wheaton World Wide Moving has simplified the process of knowing how to hire the right moving company by providing you with some tips and tricks of the trade. The content includes helpful tips such as what questions to ask before hiring a moving company as well as some common mistakes to avoid. We’d love to answer any other questions you might have about moving – feel free to contact a Wheaton representative to help you with your next step in the moving process. Like what you saw? Feel free to embed this free infographic on your Web site using the code provided. If you want more information on the next steps in the moving process, feel free to contact Wheaton World Wide Moving. A very informative and descriptive nice infographic too. Hiring a verhuisfirma (moving company) needs proper screening. The above information shared is extremely vital and will help you while choosing the right vendor. Very nice infographic shared.